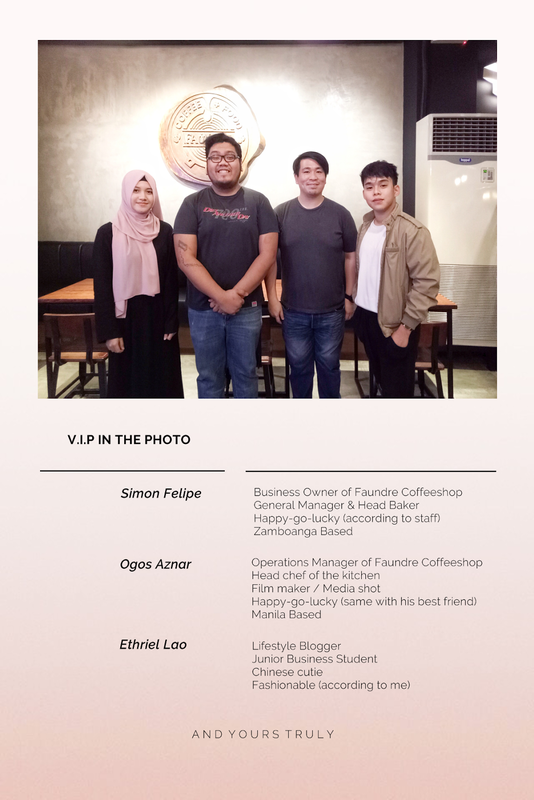 Simon Felipe is the owner and general manager of Faundre Coffeeshop. Aside from that, he’s the head baker of the pastries in the coffeeshop. He has a culinary degree and pursued into becoming a professional baker. According to one of his staff, he’s a very relaxed and happy-go-lucky person so it isn’t hard to work with him. Fun fact about him is he’s a cat lover and not keen with social media. Ogos Aznar is the operations manager of Faundre Coffeeshop and the head chef in the kitchen, he also has a culinary degree together with Sir Simon. He stand beside his best friend Sir Simon and share ideas together then think of a process on how to make their ideas into reality. According to him, “we just do whatever comes in our mind” and it’s mostly unique. What’s the meaning behind Faundre? And what inspires you to name your business as it is? Faundre in dictionary means casting metals. We came up with this name because beside this coffee shop is a casting metal shop and that inspired us to name it as such. Faundre is usually mispronounced so we decided to name the coffee shop as its pronunciation \'Faùn-Drē\ to help people pronounce it correctly. How would you describe the aesthetic and style of Faundre? Our theme is industrialized and very millennial. We also displayed artworks from different artists which was trained by Sir Ogos. But the main thing is, “we just do whatever comes in our mind”. We shared ideas and we came up with this. What inspired you to establish this kind of business? We love coffee. We’re passionate with different kinds of coffee and we love discovering them. Our main focus for Faundre is coffee, the rest is just secondary. We really looked and travel North to find the best coffee for Faundre. What advice can you give to those who are aspiring cafe owners? The advice we can give is “Just follow the passion, and find the pressure”. Faundre is two years in the making, so you really need to be passionate in what you do. 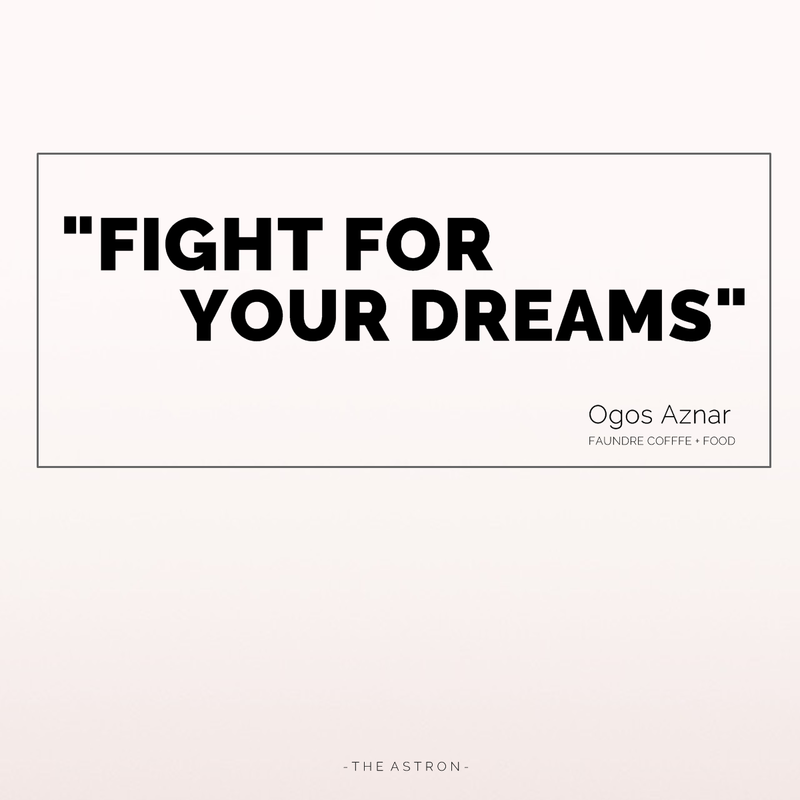 O: Fight for your dreams. S: I’ll check my recent used one. Thank you so much for the calm service and friendly bosses, Faundre Coffee + Food. I personally enjoyed the chitchats I had with them, and it was a nice experience. 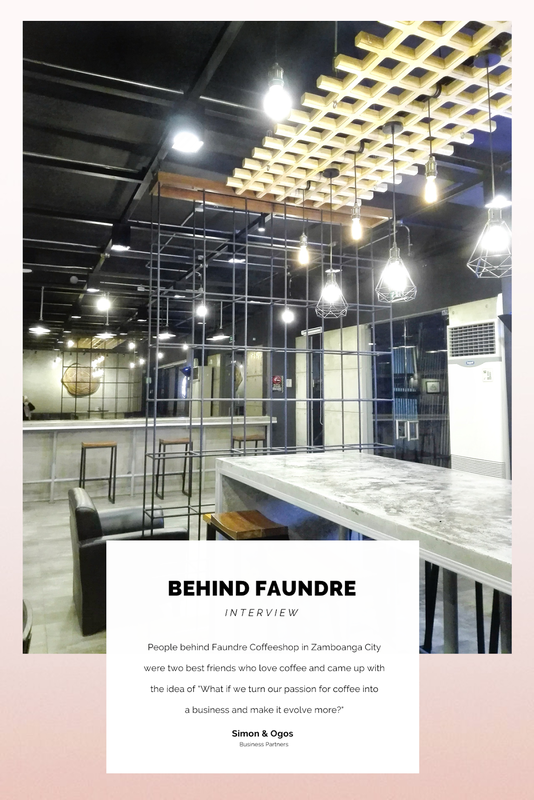 Stay tuned for the whole review of Faundre Coffee + Food soon. Tried the shop for the first time tonight. My pros and cons: Pricing, very reasonable -affordable, really. Background music is classy, and unobstrusive, exactly the way it should be (played in the background and not loudly so as to compete with clients' conversation and cause them to holler at each other. Appreciate that very much! On the other hand, my carbonara was like so "dry!" While it tasted alright, it needs to be creamy, pleeeease! The latte came plain and I didn't get sugar until I requested it: some like it sugared or with some flavored syrup.